IMS Lettings Solutions are pleased to present to the market this immaculate 5 bedroom detached family home at Heyford Park, an exclusive development providing a unique blend of character buildings set alongside modern design located a short drive from Bicester within the mature Oxfordshire countryside. 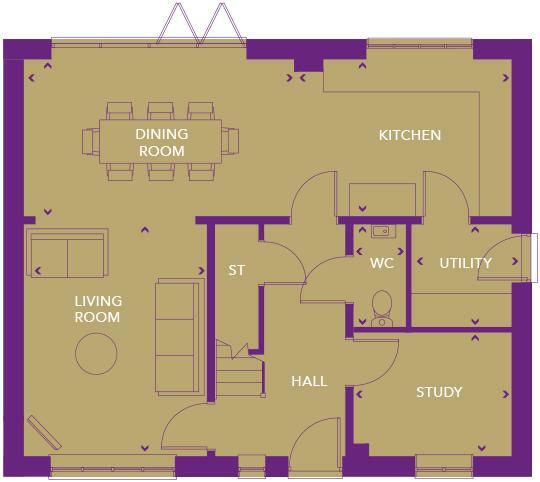 Please note we have various plots available and the photo’s shown are of the show-home. ‘The Hunsden’ is an exceptional five bedroom detached home spread over three floors. The property boasts an open plan living room, dining room and kitchen with bi-folding doors to the garden. There is an en-suite and walk-in wardrobe to the master bedroom and includes a study, high ceilings and garage with driveway. With open spaces and country views, spacious homes and family friendly facilities. Heyford Park provides residents with all the benefits they would expect from modern country life. Set within 1,231 acres, Heyford Park’s vibrant community welcomes a new era to this desirable village. Everything a successful community needs will be provided, including a high street, shops, pub, free school and new community centre all built around a central village green. Britain’s number one shopping destination, Bicester Village, is less than 6 miles’ drive away from Heyford Park. Bicester Village is both a tourist attraction and the UK’s leading designer outlet village. The Pioneer Centre located in Bicester town centre offers a variety of retail outlets and eateries, along with a 7-screen cinema where you can watch the very latest blockbuster film. Situated 16 miles north of Oxford town centre, 6 miles northwest of Bicester, 16 miles southeast of Banbury and 3.5 miles to the southwest of Junction 10 of the M40, Heyford Park provides unrivalled access to the rest of the UK.